OMON Special Forces have violently dispersed a sanctioned opposition protest in Moscow, the Sobkor®ru news agency reports. Around 40 people had gathered in Arbat square, coming together to speak out against violations in the December 2nd State Duma elections. The demonstrators also brought signs to show support for Oleg Kozlovsky, a leader of the Oborona youth movement. On December 20th, Kozlovsky was apprehended near his house by a district militsiya officer, and taken to the local military enlistment office. Young men in Russia are required to serve as conscripts in the Russian army, although exemptions are made for University students, and students may train to become reserve officers instead. Kozlovsky had completed training courses at Moscow State University, and was certified into the officer corps. The enlistment office claimed to have lost Kozlovsky’s documents, and proceeded to question him. Subsequently, he was illegally enlisted into the army as a common soldier. Kozlovsky was also subjected to a medical examining board, which ignored a medical condition that excludes him from service. He has since been sent to a military base to start his service. The peaceful demonstration lasted only half an hour. Swinging night sticks, officers charged the demonstrators, hauling some 20 people off onto waiting mini-buses. Their crime is described as changing the subject of the picket from what it was registered as. As yet it remains uncertain whether any of the protestors were seriously injured. 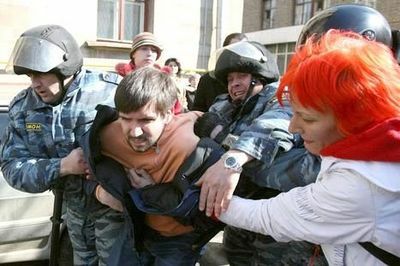 The Other Russia coalition has denounced the arrests, and has said that Kozlovsky’s detention was politically motivated. “We take note that the Oleg Kozlovsky’s forcible dispatch to the army represents yet another method in the campaign against political activists. It stands side by side with murders, beatings, forced psychiatric hospitalization, threats, arrests, shake-downs, and other,” the coalition’s press-release stated.